Last week, I shared some highlights from Carl Sandburg’s folk song collection, The American Songbag. This week, I dig a little deeper. And who will shoe your feet, my love? And who will glove your hands? When I am gone to a foreign land? Why not me for mine? But I’m comin’ back if I go ten thousand miles. Oh, who will tie your shoes? And who will kiss your ruby lips when I am gone? And you will kiss my ruby lips when you come back! So why not me with mine? The notes for “He’s Gone Away” say it’s “of British origin” and that “[o]ther mountain places in the southern states have their song about going away ten thousand miles.” Particularly noted is the “exceptional theme of the white doves flying from bough to bough and mating,” so I thought it was interesting that Crowfoot’s version also includes the dove, though in a different way. When I’ve gone to the foreign land? I hope my body may melt like dew. And then you’ll know I’m done. Now, the reason I got so excited about this text in The American Songbag is because it contained in one song textual elements of two songs (Crowfoot’s “Winter’s Night” and Molly & Maggie’s “The Blackest Crow”) that I had previously never connected. This may not be terribly surprising, given that these songs share a common theme, but still. Additionally, Sandburg’s notes on “Who Will Shoe Your Pretty Little Foot?” conclude with: “A little book could be written around this song and all its ramifications in the past.” Indeed! This summer, my mother went to an estate sale and came home with several songbooks. One of them was The American Songbag by Carl Sandburg. I was surprised to learn that this was the same Carl Sandburg as the poet! Further poking around revealed that The American Songbag had its own entry in Benét’s Reader’s Encyclopedia. It was clearly a big deal! Opposite the title page is a list of other works by Carl Sandburg, including, under “For Young People,” something called Rootabaga Pigeons. Rootabaga Pigeons?! The copyright page includes the following notice: “[This book] is manufactured under wartime conditions in conformity with all governmental regulation controlling the use of paper and other materials.” The American Songbag was published in 1927, but perhaps the edition I have was printed during World War II…? The prefatory notes include this tidbit: “Leo Sowerby was twenty-one years old when a Chicago orchestra produced a concerto for ‘cello by him entitled ‘The Irish Washerwoman.’” Wow, can I play this? “Sourwood Mountain” (p. 125): The notes say this song has many different versions. I learned one in elementary school, to a tune that is clearly related to the one in the book. The first verse is the same one I remember, but the only other verse I recall (“My true love she lives in Letcher / She won’t come and I won’t fetch her”) is not in The American Songbag. The Missouri Harmony (p. 152): I was quite surprised to discover in the middle of this songbook pages reproduced from The Missouri Harmony, a shape note tune book I have only once had the opportunity to sing out of. Apparently it is said Abraham Lincoln sang from The Missouri Harmony. “The Brown Girl or Fair Eleanor” (p. 156): I had to mention this song because it has my name in it! In the text, the Brown Girl and Fair Eleanor are rivals for the affections of one Lord Thomas. All three characters are dead by the end of the song, but incredibly, the tune is lilting and cheerful. Also, Abraham Lincoln may have been sung this song as a child. “Weevily Wheat” (p. 161): This is the first time I’ve come across this song since I learned it in elementary school. The tune is roughly the same, though I remember singing it in a different meter. The only verses I remember are the first and the one about going over the river to the sheep. The notes say that “the Charley of this song may be the Prince Charlie of Jacobite Ballads.” I always remember knowing it was about Bonnie Prince Charlie, though somebody must have told me that. “Little Ah Sid” (p. 276): This is a racist song about Chinese people. “Mag’s Song” (p. 316): A second text is included with this song, and it’s actually this second text that piqued my interest. Entitled “The Orphan Girl” or “No Bread for the Poor,” it appears, I’m pretty sure, in The Shenandoah Harmony, a new shape note tune book published just this year. The text tells the tragic and melodramatic tale of an orphan girl who begs at the door of a rich man who refuses to let her in, so she freezes to death overnight. It’s like a cross between “The Little Match Girl” and Dives and Lazarus. Today, I bring you an odd fact about my book that you would never know from reading it. Sparkers is set in a city called Ashara, and Ashara is Grenoble, France. By that, I mean the layout of Ashara’s streets, squares, neighborhoods, and geographic features is based on Grenoble’s. This was actually quite a late development. In 2011, in the middle of yet another revision of my manuscript, I decided I needed a map of Ashara. I wanted to know how long it would take characters to walk from Point A to Point B, the number of city blocks between key locations, what cardinal direction various landmarks lay in, and so on. Having a map would allow me to give every important place in the book an absolute location and keep the manuscript consistent with itself. Part of the fun of fantasy worldbuilding is sketching maps of imaginary countries, but drawing an entire city street map from scratch sounded laborious and tedious. Luckily, I had just returned from a semester studying abroad in Grenoble, and I had kept the map of the city issued to us by our program. That map became the blueprint for Ashara. 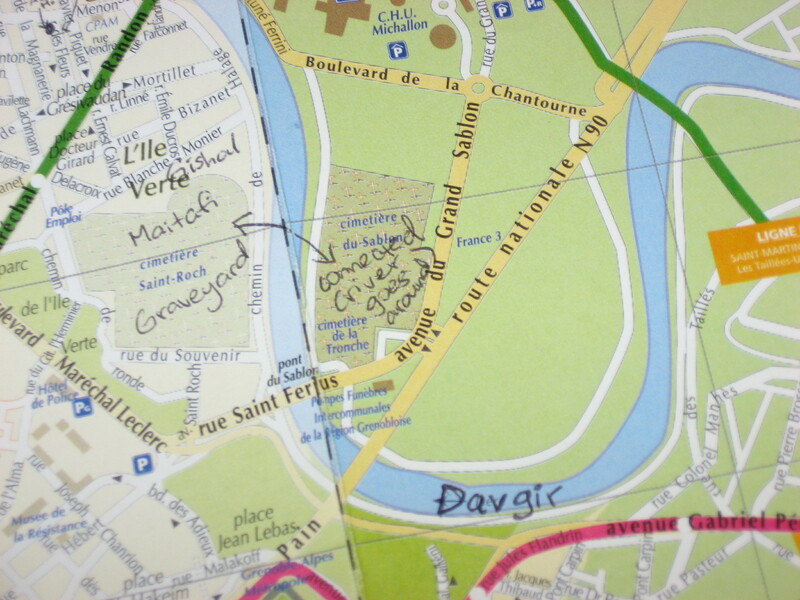 Of course, Ashara already had a geography—the Davgir River, a central market, a large cemetery—but I just superimposed these features on my map of Grenoble. Sometimes I adjusted the layout of Grenoble to conform to facts I had already established for Ashara. For instance, I decided the Drac (a real French river) corresponded to the fictional Sohadir River, but I pushed it farther west. More often, I allowed the layout of Grenoble to dictate the geography of Ashara, since much of that geography wasn’t worked out in detail in the manuscript. The result is that many landmarks in Sparkers have real counterparts in the city of Grenoble. Ashara’s Davgir River is the Isère. The bustling covered marketplace in Sparkers is located on the site of Grenoble’s Jardin de Ville. The Assembly Hall, from whence Ashara’s ruling magicians govern, occupies the same spot as the hôtel de préfecture in Place Verdun. And my main character, Marah, lives on the Ashari street corresponding to Grenoble’s rue de Chamrousse. Ashara doesn’t look much like Grenoble (for one thing, it’s not surrounded by mountains! ), but it is laid out like it. So if you ever want to feel like you’re walking the same streets as my characters, you’ll have to visit Grenoble! Hello and welcome! Today is my birthday, and to mark the occasion, I’m launching this blog. And I’m launching a blog because I wrote a children’s fantasy novel, and it’s going to be published next year! After years of being extremely cagey about my writing, I’m slowly adapting to being an author in public. For those of you who know me, I’m glad you’re here! For those of you may not, here is a brief bio. My debut novel is called Sparkers and will be published by Viking Children’s Books in the fall of 2014. It’s about a girl and a boy who forge an unlikely friendship when a mysterious illness strikes their city. It has plenty of magic, music, old books, and snow. Sparkers was a long time in the making, and I’m very excited for it to be a real book. While I expect to blog about writing and publishing, I’ll also post about other things that interest me. Like maybe hurdy-gurdies. I’m a first-year Ph.D. student, an occupation whose side effects may occasionally include sporadic blogging. But please feel free to ask me questions in the comments, and if I can spin my response into a post, I will happily do so.